If you haven’t been to Block 16 yet, you are missing some of the best sandwiches in Omaha. On any given day you’ll find three or more Vegan sandwiches as well as fries and onion rings. And for the Meetup, they hooked us up with even more! Sides of veggies in little cast iron pots, and salad, all from local farms. 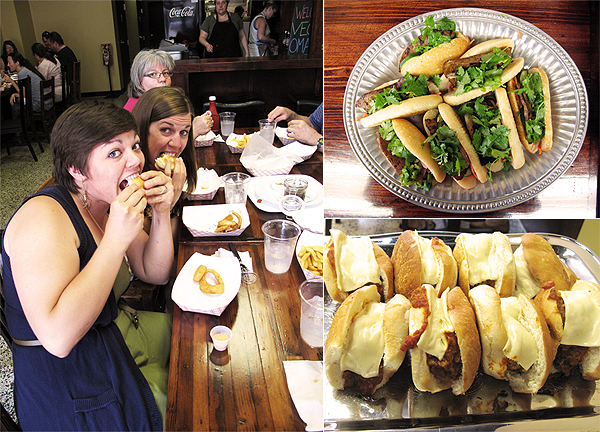 Here Meetuppers are chowing down on some sandwiches in crusty baguettes straight from France! Well, almost. The baker is French. That counts? We’ve got a spicy Bahn Mi with seitan, pickles and fresh herbs. And below is the Meatball Sub made with their savory lentil meatballs. Not shown (because it got snatched up so quickly) was a big meaty sandwich of house smoked tofu and BBQ seitan. Above we’ve got roasted root vegetables, perfectly cooked, tender inside with a crisp, salty exterior. Below is the salad that a few diners proclaimed “the best salad in Omaha!” And we won’t argue. Pickled veggies and radishes and the showstopper…cashew feta on top. Creamy cashews with lemon juice and herbs. It was actually one of the first bites and really set the mood for the amazingness that lay ahead. 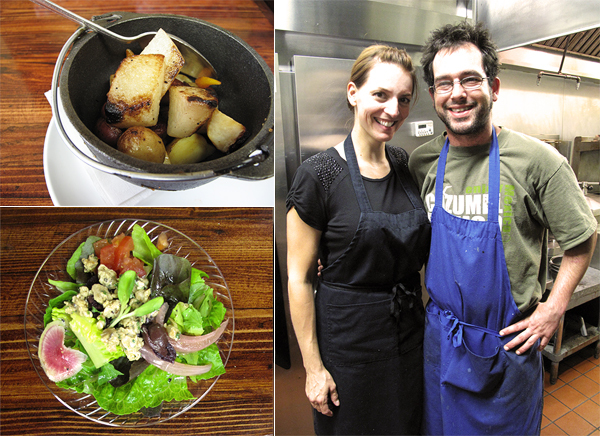 And there’s Jess and Paul, tired but happy, after a busy busy day serving the vegans of Omaha. Thanks you, guys! 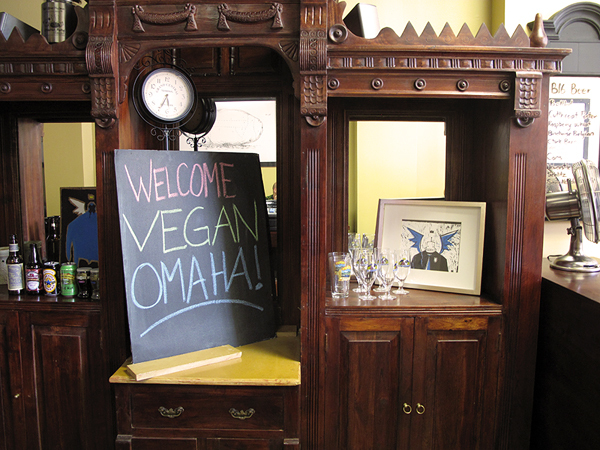 And finally, as if we weren’t stuffed enough, a Blueberry Cheesecake straight from Vegan Omaha Headquarters. Thanks for showing up, everyone! Hope you had as much fun as we did. Seriously, I just leaned in to take a bite out of my computer monitor. Fun friends and fine food—what better way to spend an evening? Thanks again for the swell time! Block 16 was outstanding. Yum. 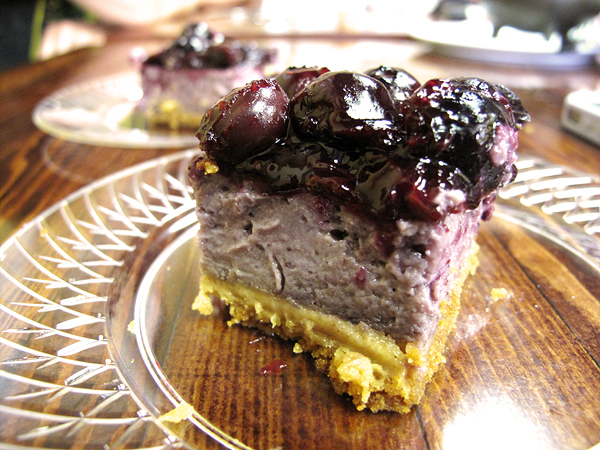 And that blueberry cheesecake. Oh, My.